The community tennis programme at Kings Hill has received a prestigious award by the Lawn Tennis Association. 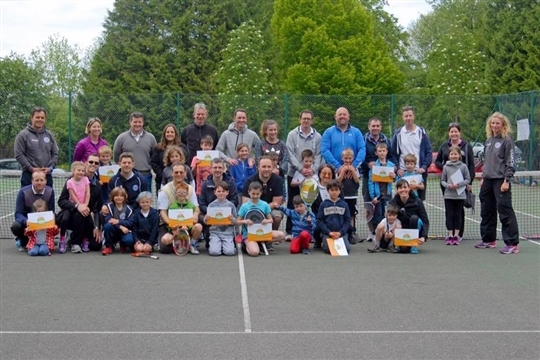 Founded by Taylor Made Tennis as recently as March 2016 the local club has beaten off competition to be named Kent’s Community Venue of the Year. The LTA award recognises the determination of the club to provide grass roots tennis to children and adults in the local community. The opportunity to learn how to play tennis and take part in festivals, individual competition, team competition and family events has been brought to Kings Hill by Chloe Ayling and her team of coaches and volunteers. The award is testament to the community values of Taylor Made Tennis and its success bringing tennis to people of all ages and abilities. Founder and Director Chloe Ayling started the programme at the beginning of 2016 with the vision to make tennis affordable and accessible to all. In less than a year the club has gone from strength to strength running after school clubs, PE lessons and an extensive adult and junior programme throughout the week. The team offer tennis camps during school holidays and has run a series of non-profit family competitions. Chloe and a growing team of new coaches and volunteers lead sessions with passion and boundless energy and have created a buzz about the previously under-used courts. Future plans for the club include the running of junior and adult teams in Kent leagues, the introduction of disability tennis, inter-school competition, and low intensity sessions for the older generation. We hope to expand the facilities over the new few years and are seeking sponsorship to able us to do so.